Week 1 of finals done and dusted, with coaches either putting the feet up for a week, putting it all on the line for a preliminary final birth, or into day 4 of their post-season bender. Even if you’ve got the week off after a qualifying final win, it’s no time to forget the team for a week and enjoy the footy without worrying about Supercoach scores. You still have to make decisions that will impact your team’s performance here on in. And of course, those who are playing semi-finals need to be on their toes from here on in. Those after some pre Semi Final motivation MUST listen in to this week’s podcast and/or to Jock’s interview with the man winning Supercoach 2013. Captivating material. This week is all about getting players in that will give you an edge to win your way to another week in the finals, and beyond. While many will have little to no trades left, sometimes you need to put the plums on the line to paraphrase Jock, and make brave decisions. This is the week to do so because the second chances are done, no more next week if you lose. 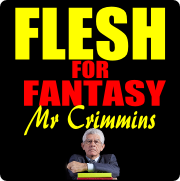 Flesh is here to get you one win closer to the Holy Grail. Rory played out of his skin against North Melbourne on the weekend, scoring himself a lazy 180 SC points. This is on the back of some good form of late, and it seems the return of Patrick Dangerfield has aided his football. He’s not only racked up the disposals, but Rory’s also been a tackling machine – 7 tackles v Fremantle, 8 tackles v North Melbourne. Sloane clunked 7 marks v Fremantle and 10 v North Melbourne. He’s in sensational form right now, and with a match up against Melbourne in the preliminary final, and West Coast in the Grand Final, to whom their season will be over by then, he’s someone worth considering. Due to GWS’ terrible record this season, majority, if not, all their players go unnoticed. However, the last 3 weeks from Callan shouldn’t. Scores of 132, 158 and 126 would just about make him one of the in-form players going around. Before you argue he’s got a tough run home, every game for GWS is a tough one, and 2 of those 3 scores were against sides entrenched in the top 8 (132 v Collingwood, 126 v Fremantle). Owned by just 1.04% of teams, he’s could be the ultimate POD if you need a player to tip a do or die final in your favourite. It seems the day out against St Kilda 3 weeks ago has seen Motlop hit a purple patch, with 3 scores above 100. He’s kicking goals and getting plenty of the footy in a role that sees him float in and out of the midfield. While he does have a so-so run home, take note that Geelong’s last 2 games are at Kardinia Park or whatever the young folk call it today. With Fremantle chomping at the heels of a potential top 2 finish, the Cats will not taking the foot off the pedal any time soon. Expect consistent scores in the 100s and a nice POD for those looking to dump Buddy. After a down patch in the middle of the year, Shane Mumford has hit form at exactly the right time. He’ finding himself in games and having more of an impact than he was during the middle stages of the year. While Swans do play St Kilda, Geelong and Hawthorn in their last 3 games, none of them are blessed with All-Australian ruckmen, so Mumford will get first crack every time. If you’re still stuck with a Kreuzer or a Jacobs, Mummy could be the man to win you a final. As the Community’s own Crouching Tiger sang, “How s#%t is Bryce Gibb?” Answer: very. What a let down he’s been this season, prancing around, too scared to get anywhere near it. Many, including myself, were excited at what Bryce could become under new coach Mick Malthouse. How wrong were we? Dumping Gibbs is a matter of whether you have disposable trades left. Those with less than 3 will be forced to keep in, and I’m in this unfortunate boat. Those with more than 3, and have no other trading obligations, I would dump him. There’s no point keeping this liability and put yourself at a potential disadvantage. Get him out and turn him into a consistent scorer. Nothing personal Bryce, you’re just no good at the moment. The man many fancied as a Brownlow smoky has hit the wall late in season, and it’s significantly affected his numbers. After collecting 40 touches against the Eagles, he’s had just 26, 22 and 21. He’s not tackling either, registering just 1 tackle against Collingwood. While he may go big on St Kilda (who wouldn’t at the moment? ), he then faces the toughest road trip in footy to Geelong, and then hosting the best side in the competition to end the season. Bit like Bryce Gibbs, if you’ve got some trades up your sleeve, I would dump Hannebery and send him to any of the Fremantle boys you don’t have – they’re on verge of going nuts. After the pub had a week off to re-stock, it’s back open and the beers are flowing. Here are the burning questions heading into semi-final round. ANSWER: Depends on your ruck situation, Chandanraj. I would go Dusty Martin, only because he has more upside, better chance of pumping out that 120+ score. That said, if your rucks a little thin, Minson for mine. Assess the situation, but if your rucks are ok, Martin. ANSWER: Only if your opponent has all 3. As mentioned in the podcast, it’s all about matching up and getting the edge on your opponent. Keep in mind, Fremantle won’t be taking the foot off the pedal – Lyon said that in press conference recently, and they can smell a top 2 finish. Fremantle have an easy run and you don’t want to miss out on a big score from one of the big 3. Assess opposition and use trades elsewhere if needed before deciding which way you go. ANSWER: Tough on Stuart, all 3 are similar scoring players. Henderson’s purple patch seems to be over with scores of 85 and 53 in last 2 (edit: most decidedly so.. he is OUT this week), so I’d rule him out. So out of Ellis and Hanley, I’d go Hanley purely on the consistent scores. Ellis could be a match winner, but I’m still not sold on him just yet. Hanley for mine. ANSWER: He’s not the worst player to have on the field, given his potential to score quite well. Probably is, there’s quite a big gap between his best and worst scores. I would say no, and trade out if you can. But if you’re unable to, don’t stress too much, because as you said, Brisbane’s finals run is quite good and he does have potential to score well. ANSWER: In short, no. Duffield looks shot, and not the player he was at the start of the season. Jack Grimes at $332,700 would be a better option if you were strapped from cash. If you’ve got $$$ in the bank, or trades to downgrade, send Clisby a bit higher, but avoid Duffield if you can. That’s it for this week’s Flesh. All the best in this week’s semi-final action. Send any questions to @Mr_Crimmins, or post below in comment section. ive got 4 trades left and 93k in the bank.. should i trade duffield or not? if so then who for some thoughts? Upgrade Staker first I reckon…. But in all seriousness, I would trade Duffield/Staker for someone like Houli (POD), Scott D Thompson, Shaw or even Scotland, who may get a bit more of the ball now that Judd is out for the season. Clisby is out for 3 weeks with a suspension…. What does the community think about Matthew Pavlich??? Too risky for mine. Id look at someone like a Bartel if you have not got him already. Even a Jarrod Roughead may be a good option. Any news on when Kreuzer is meant to return? Yep. Bargain and capable to be highest scorer on the weekend. Will be angry this weekend and will punish all around him. I have 2 trades and I dont know who to trade out!! Who should I trade out? Probably don't trade this week. If you need to trade, then Gibbs to someone like Hibberd, Taylor, Enright, Burgoyne or even Jed Adcock. The thing is , how many times has a player who's been on a rough period like Gibbs i.e Selwood , Terlich then they start scoring high numbers again . You back your judgement and have faith in your players. you wouldn't pick them if you didn't have faith . Get him in: Brandon Ellis. Averages 100.4 if you take out the five games where he was red vested (scores of 35, 35, 6, 31 and 38). Nice run home with Carlton, GWS & Essendon. POD too being only in 4.77% of teams. Get him out: Ibbotson has to go – out again this week and cannot afford to carry injured players in the finals. Do I get in Harry Taylor or Hibberd for him? no need to tell you that these are points chasing moves and if I win this week i'm left with only 1 trade for next week, so Mayne/Taylor performances have been taken into account! Thoughts as always are appreciated!! I think you are well within your rights to trade out Gibbs but I would hang on to a precious trade and keep Boomer. He's been in great form although obviously had a shocker last weekend just like Gaz. No player is infallible from having the odd quiet game but reckon he's worth hanging on to for at least another week. Most important thing is a full team. Can you trade Nichols to Cox and hold Kreuzer? Should be back next week – then you can swing Cox into forward line through McBean and bench that spud Zorko. Clisby to Hanley a nice to have if you have money left over. Otherwise, upgrade Gibbs or Staker to Hanley if you don't have the cash. Zorko/Lecras to Cox just in case something happens to Roughead, that you can switch them. Bring in Harry Taylor or Hibberd? Even though I've got Heppell and Goddard? Anyone rate Harry O as a defensive option? I'm thinking either Hibberd, Hartlett, Harbrow, Burgoyne or Adcock. still need help with trades and such (its my first year playing supercoach – into round 2 of finals) I have 187k in the bank with 5 trades left. Once again all advice is much appreciated, good luck for the rest of finals guys! Titch to Watson, and use the rest to upgrade Macaffer. Tom lee out Cyril in. You need to check this as will be touch and go with the cash. Is it worth it to trade JJK to someone like JPK or Deledio. I would be left with 0 trades but i need someone who will go big this week. 1k short of roughead but i could get tippett or cloke if they seem better. Bringing in Watson and Selwood would be smart play. JPK will still deliver. Think he's heating up and won't go below 80. Although I love Griffen. And with Boyd coming back, it will probably mean bigger numbers for Ryan boy. Watson is a risk of getting tagged where as Sloane won't be the first person tagged if dangerfield is there and the crows have a easier run home. Won't Gibbs be given more of a free running role now that Juddy and Carazzo are out for the season? I would have thought Mick Malthouse will have no choice and thus drop the run with shite he's been giving poor old Bryce in recent times? Who crucial week of finals for me this week, who would be the best choice for captain? Always Garry as VC! Imagine pendles comes out with a 130, you'd keep that for sure, but Garry is so dangerous to produce a 160! As long as you have a freo mid, danger, griffin etc, they all play sunday. Pendles VC then Selwood, I just can't see Ablett pumping out a big one this week. either JJK to Harvey or JJK to Minson with Cox back into FWD line. Got Goldstein in my rucks and the usual suspects in FWD line. I'd go JJK to Minson with Cox back in the forward line. Because of Boomers age, I think he will have erratic scoring, as evidenced last week. Do I use loophole on Pendles and pick Gaz if he doesn't perform or loophole on Gaz and use on Rockliff or Cox if he doesn't perform? I have a feeling Pav could hit form over the next 3 weeks and go crazy. Is it worth trading out someone like josh kennedy from west coast to pav? I traded in Pav last week and was pretty dissapointed, however he nearly got 70 and was pretty unaccurate. Reckon he will pump out some solid 110's over the next few weeks! No, there are plenty of better options out there and unless you have at least 3+ trades the. Hold. I have Minson and Kreuzer as rucks. In one league I've secured the prelim, in another I'm playing a semi this week. 1 trade and $79k left. Rowe is my ruck cover, though I could also swing Cox into ruck and play Zorko on field. The team I'm playing this week doesn't look that great. I'm leaning towards holding on to my one trade and waiting for Kreuzer to come back. Thoughts? Swing Cox into your rucks through Rowe and play Zorko on field……this is really a smart option to consider…..instead of using that 1 last trade……. Which midfielder out of Hodge, Mundy or T. Mitchell should i go with as my 8th Midfielder? Should I have Staker (vs GWS) on the field or Buddy (vs Coll)? Can you make Buddy your emergency tonight and then use a loop if he scores well? big risk in finals to rely on players not playing…….bank the player you think will score best…. I have T.Mitchell as mid 8 with Crouch as bench cover 3 trades and 167k. Thinking Mitchell to Watson although I am tempted by Sloane as a bigger pod and has a softer run home than Watson. Have Staker as D6 either trade for Ellis or swing him forward bring in Ellis down back then trade out JJ Kennedy, Buddy, Monfries or Bartel. Or Mitchell to Watson and JJ Kennedy to Dusty Martin. PS my mids are Pendles, Ablett, Barlow, Johnson, Delspudio, Hanneberry, T.Mitchell, Crouch, L.Hunter and Griffen. Mitchell To Watson & JJK to Dusty is a very very good option to consider IMO mate……. Hey Raj, I was just thinking the only trouble? with JJK to Dusty trade, is that it means I will have too choose either Bartel or Monfries to be on the bench which seems like a waste. Would I be better to do the Staker to Ellis or how about Bartel to Broughton!!! ( I can hear you gasping in horror!!!). But it would give me another 99k so instead of Jobe I could get Swan or Jelwood. Ballsy or just plain stupid?? Unfortunately cannot get Sloane and Martin about 30k short! Thanks Raj and Daniel, I appreciate your thoughts. Good luck for this weekend! And All the best for the weekend mate……. Barlow named on extended bench? Anybody have any intel from the inner sanctum on whether he will be rested? This week I'm looking to make my last 2 trades. This leaves me with 2 midfield spots (M8 and M9) to fill and $885,300. Thumbs Up: Do I go with a cheaper premo (Sub $500K) like Watson/Delidio/Mundy/SMitchell and then another mid pricer that can score like DSwallow (GCS)? Thumbs Down: Spend big on one supremo eg Griffen/Danger/ and screw having any bench cover? Will Jobe last another 3 weeks?? Trade out JPK instead of Mitchell and that will give you more cash for the likes of Watson and another better premium. If that doesn't work I'd definitely go thumbs down. But above all HOLD YOUR TRADES if you can. Thanks Watto, however there's no point holding my trades if I go out this week so 2 trades it is. I know JPK has had 3 shockers in a row, but he's pumped out 11 tons, 2 x 90s and 2 x 80s this year so I can't trade out a premo unless injured. Cloke is averaging 95 so he's gone. I am trading T.Mitchell to prem back via Vlastuin. Tossing up between Heath Shaw and Pearce Hanley. Who will average more? Will Shaw get rested before the end of the season? Mr Cimmins you are wrong on Gibbs. His only game purely in the midfield was round 1 when he smashed it, winning a heap of contested ball. Fact is, before being drafted Gibbs was playing senior football in Adelaide and was leading the competition on hard ball gets. Yet again Gibbs is being screwed by the coach. FFS play him in the midfield. Its a joke to have him sitting in a back pocket (tagging say Mayne) or worse still tagging the likes of Ziebell. What a waste, tag a player with someone who is better then the bloke you’re trying to stop. With Judd & Carrots gone, surely now is the time to play Gibbs purely as a midfielder. Agreed, Mick has said the blues list needs an overhaul. I think they need to look at trading Hampson, Yarran/Garlett/Betts and Waite for some pace through the midfield. Play Murphy, Gibbs with some outside run. But hey I'm no AFL coach. 1 trade left, about $192k in bank. Mid8 is marc murphy or tmitch as backup. Have jjk as forward starter still. No rockliff in my team should he be a priority to get in? Or get another mid? WHAT IS THE POINT OF A POD??? Everyone talks about how they need a POD, especially come finals time. But what I don't understand is why you would get a POD at all, unless trading one in would give you the most points possible. Why go after a player just because he is different? Why not go for the player that gives your team the most points? Because trading in the highest scoring players and earning the most points is what dream team is all about. Isn't it? Completely agree, I said the exact same thing last week. However if one needs to take risks then there is no point getting in a player which the other team has. taking a punt that the POD will have a purple patch compared with the current best averaged players….and that might just get you across the top…. The key of what you said is he will score more points. That should be the reason to get someone in not because he is a a POD. If he scores less then there is no point bringing on in. Is Ablett likely to score low due to Kane Cornes likely tag this week? Ablett has been in poor form lately but it has been due to tags. So it isn't entirely his fault. If you were thinking of trading him out, DON'T. And if you were thinking of making him captain, I WOULDN'T. Hopefully his form will return this weekend, he has a good run coming up. Whos the best for captain this week? Personally I am choosing Steve J. But Dane Swan is also a great option. They are my top two. Danger everyday of the week. Watto and the Griffmeister for sure. I have clisby and ibbotson out and on the bench I also have Thurlow. I have Ryder, Kreuzer, Nicholls, and Rowe out. I can't trade Nicholls for Ryder because I don't have enough cash. Rockliff or Goldy, who to get??!! definitely option 2 for mine mate, JJK on the pine might be a waster of money and points. pendles into gazza for me…..
well….just reversed my trades due to all the "late out" rumours….mainly Goddard and Heppell!! Looks like trades may be a game by game proposition this week! I have ibbotson out with clisby and thurlow on thebench. I also have Kreuzer, Ryder Nicholls and Rowe out. and Ryder to Minson leaving me with just $2,500 left. Any thoughts or alternative trade ideas are great. ellis and minson sound very solid for the cash. I have heard that Kreuzer is gone for the year, Ryder def back next week maybe best to flick Kreuzer. I think Ellis good pick up. Question for Dream Team, who should i put as captain this week? I still have Jaegar O'Meara and Tom Mitchell and I'll be trading one of them this week to Jobe Watson (3 trades, $332 in bank, not playing this week as I won my QF last week) Is it better to trade out Mitchell as his job security is a bit shaky and if he's not named in the next 2 weeks I'll have no bench cover or O'Meara as the extra cash will help me with my last 2 upgrades? Mitchell is on the downslope. O'Meara has been steady 85+. Would thank Mitchellson for his service and whoosh him out. yeh mitchell got dropped this week- that said i wouldnt expect more than 95-100 from JOM. VC on Swan take score or put C on Ablett? Not going to keep pendles score should I go Ablett, Selwood, or Fyfe. I have a 130 from Hodge on my bench as well as Tom Mitchell. Who should I take off the field out of Dangerfield, Griffen, Barlow, Josh P Kennedy or Mundy? JPK has been the lowest of late from those blokes, but against St Kilda could put out a big score…but I would still go him. Agreed can't see Kennedy outscoring any of those. He isn't kicking at the moment which is part of the reason his scores have been poor for a while. I gave him the flick last week for Griffen. Almost brought in burnman Birchall for Ibbotson, but Charlie Dixon was the final choice. Birchall would have been OK.
Who should I bring in for Tom Mitchell? Selwood orGriffen? My opponent has Selwood so should I be looking to nullify that POD or takeaway chance on Griff? Damn auto correct on iPad! "Takeaway" a chance on Griff?!!! !